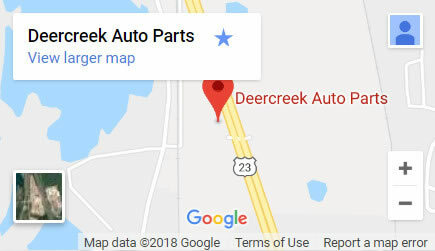 Deer Creek used auto parts was established in 1955. How do you keep a family business or any business going this long? We have seen this industry change so much, but the answer to that question boils down to two words; Honesty & Integrity. The leadership and the team that we have assembled at Deer Creek strive to give 100% customer satisfaction. We want to take care of every customer that calls or walks through our door. One of the greatest feelings for us is when a customer calls looking for a part and we have it on the shelf. We love selling and delivering great used parts. We enjoy providing great customer service. When you walk through our front door, we want you to feel welcome. We have the opportunity to take care of your need on every part of your vehicle. The great thing about it is, if we don't have it right then, we can locate that part for you and have it shipped right to our door for you. Our location just north of Circleville on State Rt. 23 provides easy, convenient access. Easy to get in and out of. We look forward to seeing you!